Smartphone usage has steadily increased since the launch of the first iPhone in 2007. For most people, phone use has become a cornerstone of daily life. However, that also brings to the light the psychological implications of smartphone addiction and how deep it runs. There’s no clear definition of smartphone addiction. The context in which the term is used could be attributed to the frequency of usage, a direct correlation to depression and/or stress, the extent of withdrawal symptoms as a result of reduced usage and potential similarities to drug-addiction and/or alcoholism. A popular, unsettling idea is that smartphones have replaced normal human interaction. This is quite evident in major public places like bus stops, malls, cafés and especially on college campuses where face-to-face interaction should be prevalent. In the context of social media, one of the ways of reinforcing this behavior is to check and recheck a smartphone to see if recently added Facebook posts have gotten any type of engagement. This virtual sense of reinforcement feels more rewarding than carrying out a real conversation. According to Assistant Psychology Professor Rebecca Houston, smartphones also act as a protective barrier from direct repercussions. “When you’re directly talking to a person, the feedback is going to be instant,” she explained. In contrast, a smartphone user can hide behind a pseudonym which frees them from accountability when they say something inappropriate or embarrassing. 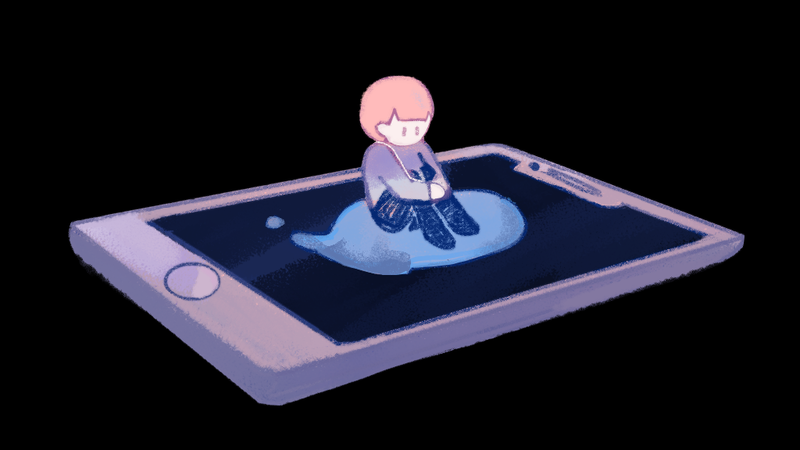 If smartphones can cause increased isolation, it’s reasonable to assume that increased smartphone usage leads to introversion or social anxiety. Excessive usage can certainly play the role of a catalyst that leads to an increase in introverted behaviors or lifestyle. However, people that are not introverted or socially anxious to begin with won’t become this way. “I don’t know that using a mobile phone could turn someone from an extrovert to an introvert, but it could facilitate existing introverted behavior because it allows them to not have to take that extra step for in-person social interaction,” said Houston. Baschnagel stressed the difference between introversion and social anxiety. “Not everyone who is introverted is socially phobic. There are introverts who may not want to socialize a lot because they’re content with the way they are. However, people with social phobia want to interact with their peers, but their anxiety prevents them from doing so,” he said. Smartphones could help socially-anxious people use the medium as a channel of communication, but it could also ostracize them from meeting people in the real world. Keeping in mind the distinction between social anxiety and introversion, smartphone usage can be a negative or positive factor, depending mostly on the person and the amount of use. What might be beneficial for a socially-anxious person could be harmful to an introvert, or vise versa. When it came to the issue of finding a direct correlation between phone addiction and depression and stress, both professors were unconvinced that they were directly connected. In essence, smartphones don’t necessarily lead to depression, but they could escalate an already existing issue. “It depends on how vulnerable a person is to developing depression,” said Baschnagel. In terms of stress, extended usage of a smartphone could isolate a person from interacting with people around them which could lead to stress. Unfortunately, there’s a lack of research involving a direct connection between the two. “It’s really hard to do a cause and effect study, but it’s definitely being recognized as a risk factor,” said Houston. It’s not strange to compare smartphone addictions to conventional ones, such as drugs or alcohol. “They share a lot of the characteristics of a traditional addiction such as compulsive use,” said Dr. Baschnagel. From a behavioral perspective, however, the issue is not as extreme as one would find with a conventional addiction. “Someone who’s addicted to cocaine, for example, would do something like selling their hot water heater to buy more drugs,” said Dr. Baschnagel. It would be extremely hard to find someone pawns their assets in order to buy a new smartphone. This doesn’t exclude the fact that there are some behavioral similarities. Looking at this behavior from a chemical perspective, there has been some research that shows similarity in behavior but not at the same levels. “All drug abuse leads to an increase in dopamine in the brain. But I think what we don’t know is whether repeated smartphone use has the same change in brain activity as repeated use with drugs,” said Dr. Houston. If smartphone addictions and conventional addictions share visible behavioral similarities, they might also share the same withdrawal symptoms. A day or two without a working phone feels like a lifestyle change for most, and not one that many people welcome. To some, the absence of a phone to hold is agonizing. Although there might some physiological effects relating to reducing smartphone use that could be compared to what is seen with alcoholism and drug addiction, it is not as impactful. “I suspect that to some degree there are some experiences that are similar to withdrawal, but not to the same degree as alcohol because it has physiological effects,” said Dr. Houston. One of the most effective ways to reduce smartphone dependency is to remove it from the pocket and keep it in a different room when in the company of friends and family. This would make it more difficult to use the phone when the desire arises. Many people find it useful to do certain activities only on another device. Using a laptop for social media or streaming videos can lower the urge to do these activities on a phone, which might lower one’s overall dependency. However, reaching out to peers or mentors to get help in reducing smartphone usage would also help in maintaining control over the urges that arise. This is a problem that a lot of society faces and is not restricted to individuals. Smartphones become more and more necessary as society becomes digitized, so being cautious about excessive use is no longer just for fringe cases.